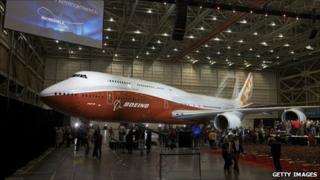 US planemaker Boeing has unveiled the latest version of its jumbo jet. The 747-8 Intercontinental will seat 467 passengers - 51 more than the current 747 - while burning less fuel, the firm says. But Boeing has won just 33 orders for the passenger version of the plane so far - from Lufthansa and Korean Air Lines. However it has also sold 74 of the cargo version of the plane, which has already flown. The new plane was unveiled to a crowd of 10,000 Boeing employees, their families and invited guests in the same hangar where the first 747 was seen in 1968. "Of all the airplanes that we've built, there is one that is identified more closely with Boeing than any other, and that's the 747," said James Albaugh, head of Boeing's commercial airplane unit. Other features of the Intercontinental include new wings, a new tail, a sharper nose, state-of-the-art engines and a new cockpit. And while it carries fewer passengers than the Airbus A380, it will be the world's longest airliner. Boeing said it was confident it would receive more orders once the passenger plane enters service later this year - although the first delivery will be for an unnamed VIP customer. It also hopes that US president's fleet of two planes - Air Force One - will eventually be replaced with 747-8s. The first Boeing 747 was launched 42 years ago, with more than 1,400 sold until the 747-400 was withdrawn from sale last year. Its new model is seen as competition for the Airbus A380 superjumbo. But many analysts say carriers were interested in smaller wide-bodied planes such as the 787 and the Airbus A350 which are designed to bypass busy hubs and take passengers closer to their final destination. On Monday, Boeing will give an update on the progress of its long-delayed 787 Dreamliner - whose late arrival has heavily damaged its credibility.